One of my favorite things to do with food is to fuse two different ethnic cuisines together and make something new. Now I don’t mix Italian and Mexican together very often, but when I do, it comes out in the form of a pizza. Homemade pizzas are the best. They’re easy, delicious, and filling; the three key things you need when it comes to dinner. 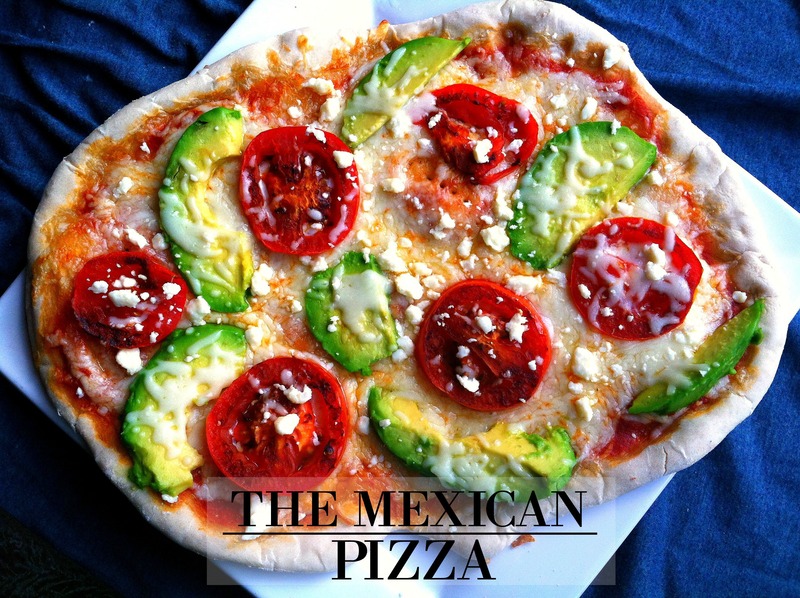 Now when I looked up recipes for “Mexican Pizza,” I got a lot of pictures that basically looked like someone had taken a Taco Bell burrito and then poured out its contents onto some corn tortillas or a pizza crust. Granted, not all of them looked bad, but to be honest, I was hoping for something a bit more creative. So when I’m forced to come up with a solution myself, this is where my creativity kicks in. First of all, I must say that this was my first time making pizza dough. I had always used pre-made pita/flat bread because it was so easy and tasted great. But something this good called for something homemade. I was able to find a great non-intimidating recipe by Sugardishme for pizza dough (because simple is awesome). The only thing I added to the dough for more flavor was garlic powder. But if you want a quicker fix, you can take the easy route and pick up pre-made flat bread when you’re at the store in the deli or bread section. Lastly, there are a couple more quick tips for how I got this pizza to look so great. I really wanted my tomatoes to be well cooked, so while the dough, sauce, and cheese were cooking, I fried the tomatoes over the stove for a couple minutes which gave it that awesome blackened look. Second, I also added the avocados onto the pizza near the end of the cooking process. Avocados tend to look dried out and have a duller color if put in too soon. Lastly, I put the feta cheese on after the pizza was completely done cooking. The reason for this being that I’ve found feta to lose a lot of its flavor after being heated up in the cooking process. In the end, I got a colorful I’m-probably-going-to-eat-too-much pizza that had great flavor and was able to satisfy my craving for Mexican and Italian food. I used Sugardishme's easy pizza dough recipe. Top dough generously or lightly with tomato sauce and mozzarella cheese and place in oven for 10 minutes. While pizza is cooking, slice up the roma tomato and place on a hot oiled cooking pan. Let it sit on each side for 1-2 minutes, or until it's started to blacken. Slice one half of an avocado diagonally. Don't worry, it may seem strange to not cut it vertically, but it will stay in place. After 10 minutes is up, take pizza out, top with tomato and avocado slices, sprinkle some more mozzarella cheese on top, and put back into oven for 5 more minutes. Take out and top with generous or light sprinkling of crumbled feta cheese.